Contains the entire 1990 Smegma Studios sessions which are the debut recordings from Earth. Previously available scattered via the "Extra Capsular Extractions" EP and "Sunn Amps and Smashed Guitar" CD. Recorded at Smegma Studios, October 1990. Reissue mastered at Aleph, June 2010. Number 5 in a series of Postgraduate Seminars produced by Earth and The Excerpta Medica. We have been blessed with a massive offering from the gods! 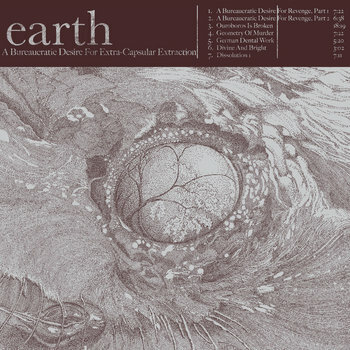 For the first time ever the debut recordings of Earth are available in one concise, beautifully documented capsule. "A Bureaucratic Desire for Extra Capsular Extractions" contains the entire 1990 Smegma Studios sessions which are the debut recordings from Earth. Previously available scattered via the "Extra Capsular Extractions" EP and "Sunn Amps and Smashed Guitar" CD. This essential collection contains every note from the infamous first Earth recording sessions. Earth was founded by Dylan Carlson circa 1989 and in this infancy stages contained several different members including: Slim Moon (Kill Rock Stars label), Joe Preston (Thrones, Melvins, Sunn O))), HIgh on Fire etc..) and even Dylans close friend Kurt Kobain. Unbeknownst to Mr. Carlson at the time was that his seemingly simplistic experimentations with heavy music would literally spawn an entire genre, style and sound borrowing from his musical theories. Of course were talking about what is commonly referred to as "Drone" or "Drone-Metal". From Sunn O))) to Pelican to Mogwai to Jim O' Rourke the impact that the heaviosity of Dylans' tone and music has had is immeasurable. This collection of the very first experimentations/recordings is an important insight into understanding the birth of this sound as well as a glimpse of the foreshadowing for the thunder to come. Liner notes from Dylan Carlson with exclusive artwork by Simon Fowler and package design via Stephen O'Malley.